Gregorio Casar, is an Austin, Texas activist. Gregorio "Greg" Casar "is a native Texan, the son of Mexican immigrants, and an Austin City Council Member representing District 4 for his second term. 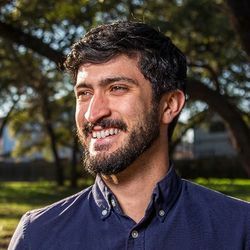 Greg previously served as the Policy Director for Workers Defense Project, and introduced Austin city council's resolution requiring employers to provide Paid Sick Leave." Austin Democratic Socialists of America hosted a "Health Justice Town Hall with Tim Faust + Gregorio Casar" on Friday, December 8, 2017. "After Tim Faust gave an impassioned lecture about the benefits of a single-payer health care system, Gregorio Casar spoke of the burgeoning local campaign to mandate paid sick leave..."
"Austin's chapter of the Democratic Socialists of America party scored a significant boost this weekend when Council Member Gregorio Casar agreed to sign up as an official member." "During the Q&A portion of the evening’s program, Casar was presented with one query from a fellow in the back of the room who wondered whether the second-term Council member would be interested in officially joining the DSA as a card-carrying member. Put on the spot, Casar wavered for almost two beats before conceding, 'I guess I should. Why not?'" From Democratic Left Summer 2018, page 3. Thursday May 1, 2014 marked the International Worker's Day. Music by Sonoita, Fandango Tejas, Mario Garza, Kiko Villamizar, Kiya Heartwood, and The Bronze Band! By June 2017, Austin Democratic Socialists of America had built a large membership of over 640 members by being active as allies against a number of attacks on communities of color, women and LGBTQ people over the last two years. This work has intensified since Trump took office. Perhaps their most important campaign, which other groups can learn from, is their current fight against an anti-immigrant bill. SB4 is a highly controversial bill that mandates local police and sheriffs to essentially become an arm of the federal Immigration and Customs Enforcement (ICE). Under the bill, local peace officers would be given broad authority to ask the immigration status of anyone stopped by an officer for almost any reason. Thus, the moniker: “Show Me Your Papers Law.” SB4 began as a priority of Lt. Governor Dan Patrick and Governor Greg Abbott. During hearings in the Senate and the House, hundreds of people, many of them immigrants or family of immigrants, both documented and not, testified and signed in opposition to the bill. Sheriffs and chiefs of police testified that the bill would undermine the trust between the police and the immigrant and Latino communities, leaving their cities and towns less safe. Mayors, lawyers, school administrators and school board members spoke out against the mass deportation provisions of the bill and its potentially devastating impact on families, children, businesses and the Texas economy. Despite these large protests, the House and the Senate passed the bill. Advocates were outraged that the bill was made far more egregious in the final evening of late-night amendments to the bill in the House, where Tea Party reactionaries one-upped each other. At the terrific Fight For Fifteen ($15 and a Union) rolling rally in May, 2014, in East Austin. — with Amy Mashberg, Anne Lewis, Gregorio Casar, Susana Almanza, Monica A. Guzman and Juanita Spears. May 2018 Mike Siegel clinched the Democratic nomination in the 10th Congressional District to challenge U.S. Rep. Michael McCaul, R-Austin, in November. Siegel won 70 percent of the vote to Tawana Walter-Cadien’s 30 percent. Walter-Cadien is a three-time challenger to McCaul and registered nurse educator in Cypress, and Siegel, is an Austin assistant city attorney. Siegel said he has a campaign organized to help unite supporters throughout the nine-county district, which stretches from Austin almost to Houston. In the March primary, Siegel won 40 percent of the vote. Walter-Cadien finished second with 18 percent in a seven-person race. Walter-Cadien had been endorsed by two of the March candidates, Tami Walker and Madeline Eden, who won 16 percent of support and 14 percent respectively. Siegel enjoyed support from major labor unions, Austin Democratic clubs and Austin City Council Members Gregorio Casar, Pio Renteria, Delia Garza and Leslie Pool. Both told the American-Statesman in May they want to protect the Affordable Care Act, increase public education funding and push for better wages for people in the district. This page was last modified on 7 December 2018, at 10:36.